We checked in with Anjali Venkat, a glass artist who will be demonstrating glass cutting and teaching glass mosaic during the Maker Faire Singapore on 11 & 12 July. Read on to find out more. Anjali Venkat is a glass artist with an eclectic sense of art and design. Incorporating the unusual into her work, she tries to give a new twist to the ordinary in every one of her pieces. Blessed with the opportunity to travel the world, she takes inspiration from the sights, colours, crafts, and people around the world. She constantly tries to learn new techniques and incorporate them into her evolving artistic arsenal. She has trained in Traditional Glass Mosaic at Ravenna (Italy), Hot glasswork at the Corning Museum of Glass (New York), Glass blowing at Oslo (Norway), and Tiffany-style lamp making at Perth (Australia). 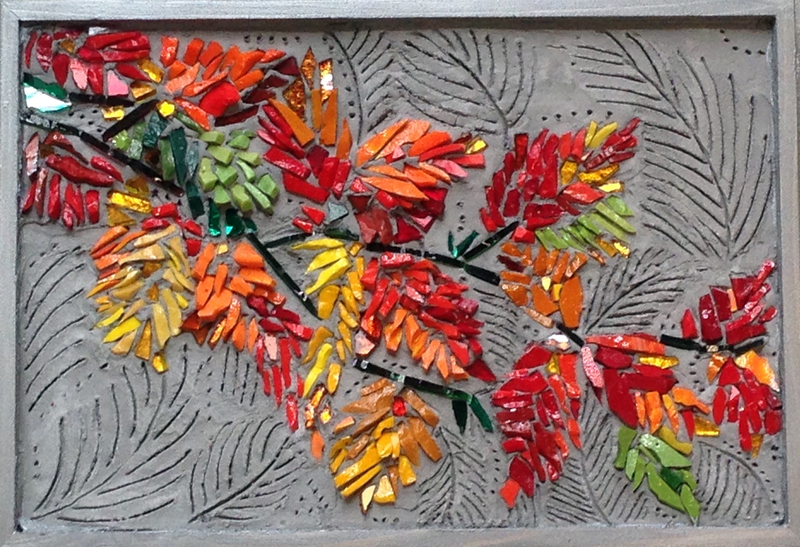 Currently, the techniques she practices involve the use of mosaic, kiln-formed glass, Up-cycled glass bottles, as well as other media like wood, paper and plastic. There is something about the interplay of the vibrant colors, textures and designs of glass, which has a mesmerizing effect on all of us. In making a mosaic there is an unlimited choice of materials, size, texture and space. It is engrossing, challenging and at times downright difficult, but ultimately making mosaic is rewarding and therapeutic. To cut the tesserae into desired shapes one has to use special nippers, cutters etc. The Maker Faire is a good platform for both makers and others to interact. Not everybody is open to the idea or has the opportunity to actually make things with their hands. This provides a unique space for giving into ones free wheeling imagination and learning a lot in the bargain. 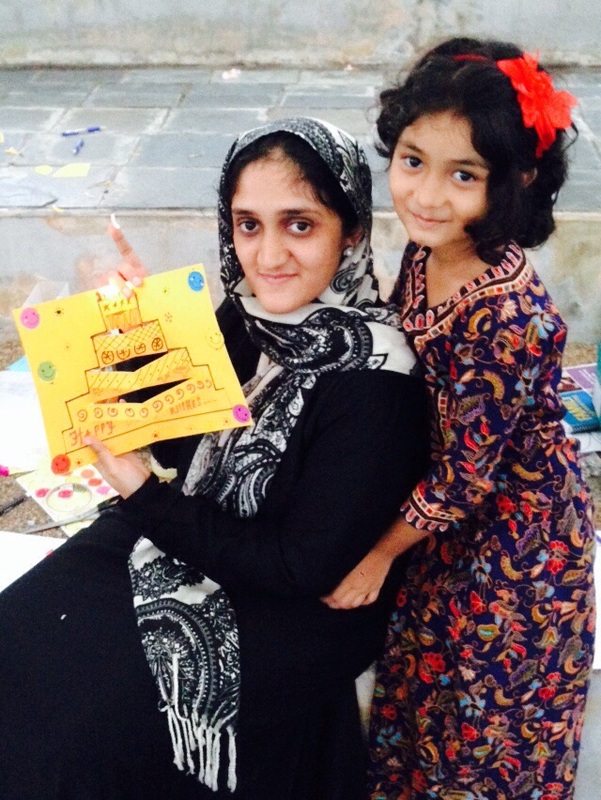 Check out this page to find out more about Anjali’s workshops! The rule of the session was “No teaching, Learn by Making”. Facilitators and volunteers walked around, giving suggestions to families as they worked together, encouraging them to build on their ideas, or simply sitting and working on their own projects. 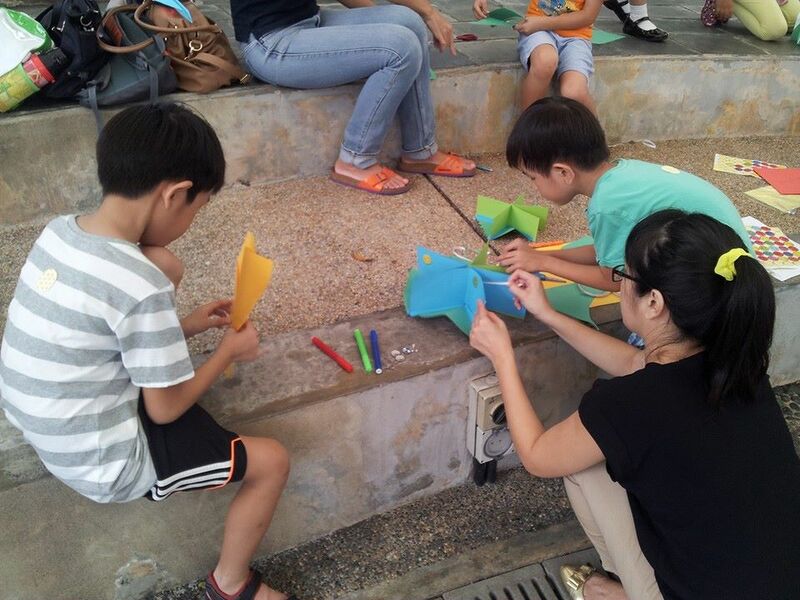 During the first session that was held, Pop up Paper Crafts and Pull Tab Mechanism was the theme and families were to work on projects around it. But it was free and easy and they could work on anything they came up with. A few examples were first done to give a basic idea and to get them to start from somewhere. 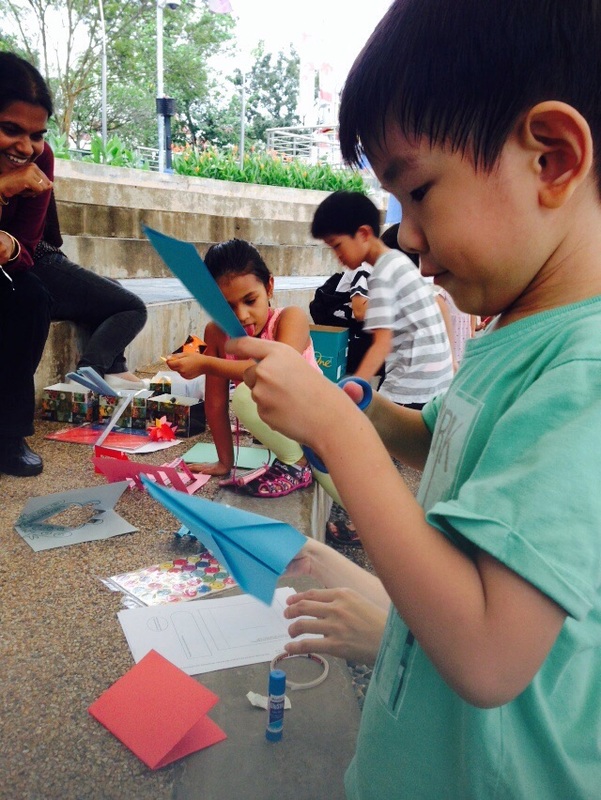 Materials like coloured paper, scissors, double sided tape, glue, pen knives and glue guns were provided. LED and batteries were also provided for those who wanted fuse both together and create something entirely new. 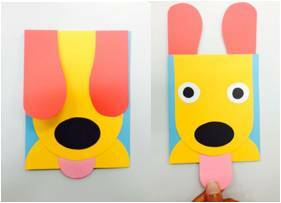 Some families first started brainstorming on what type of pop up crafts or pull tabs could be done while others started off from the given templates like the Dog ears or the Butterfly. Families created their own idea and put it to test by working as a team and spending quality time together. Here are a few examples that were done and shown to families before they started. 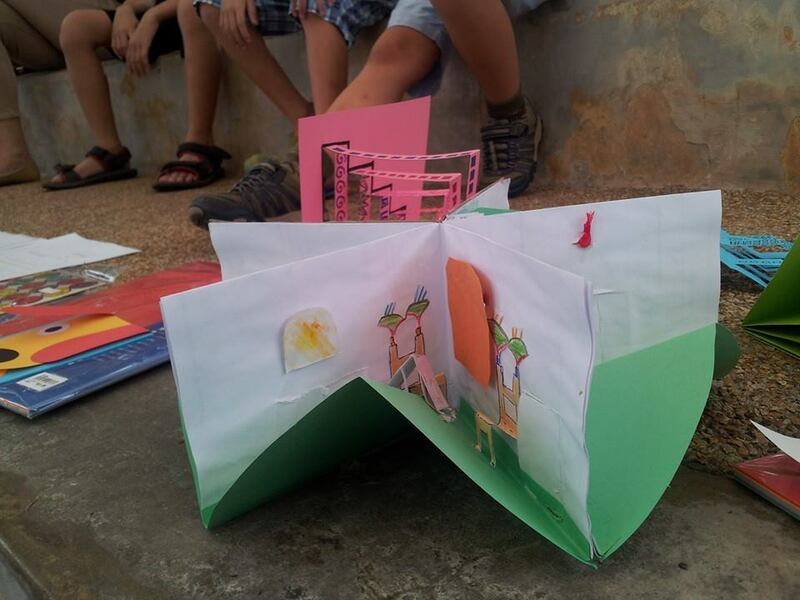 A pop up open book that can be transformed into a house. A basic pop up idea that was done before the event for families to see and get their making started. 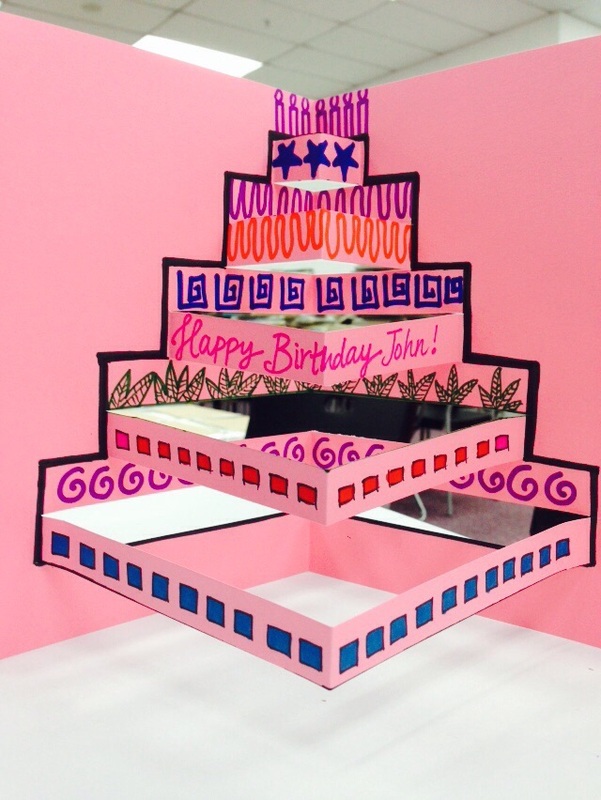 A simple birthday card example that was shown to families, resembling building structure. 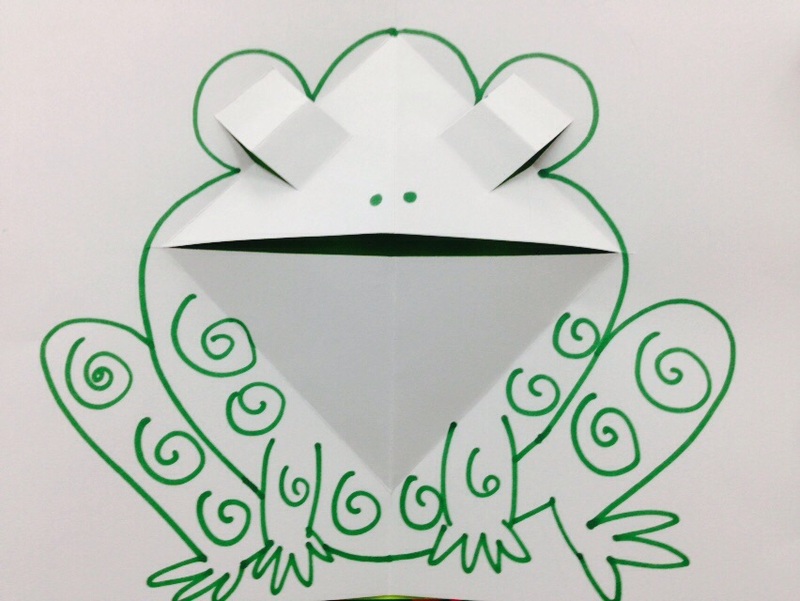 Frog pop up that can move its eyes and mouth when opened.You can learn how to do this HERE. 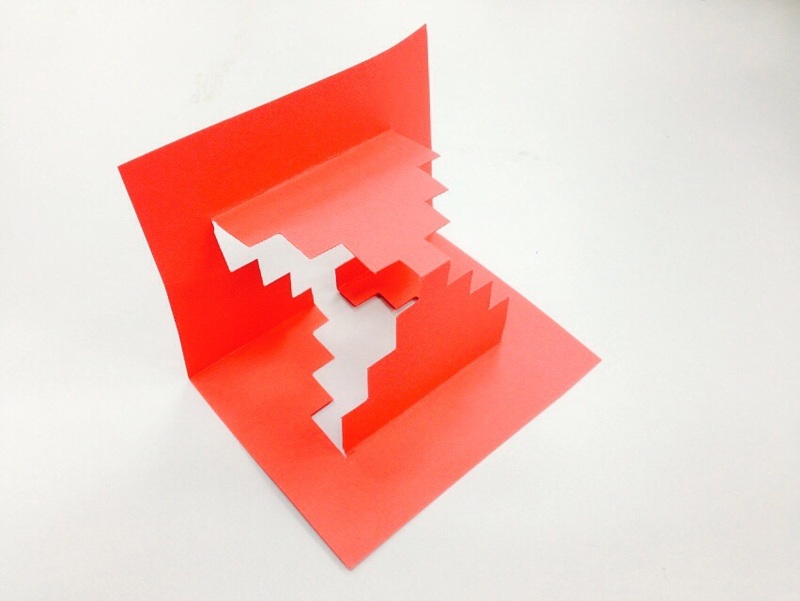 A sample house pop up card. 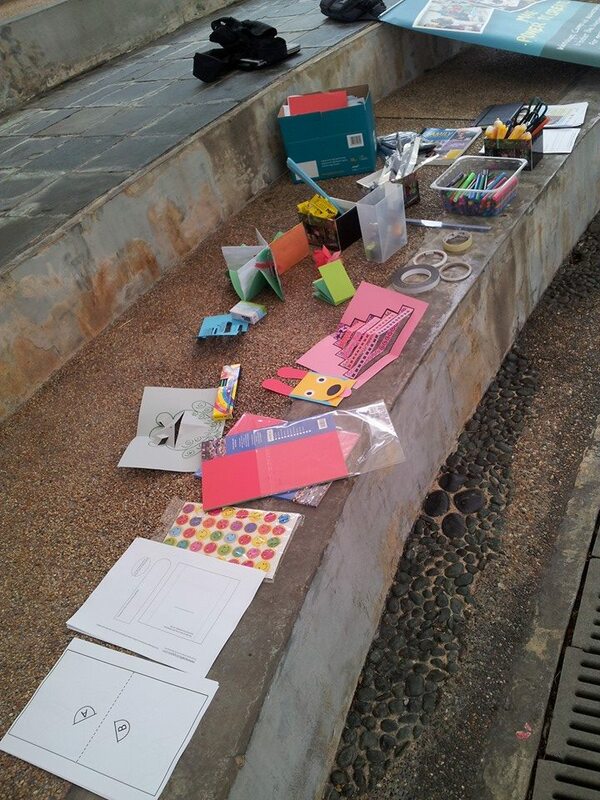 All the materials set up ready for the kids to start their new innovations! After a short debrief, kids started putting their ideas to test and got to action with the items provided. Parents helped their kids brainstorm and prop them with new ideas by questioning and making them think more. 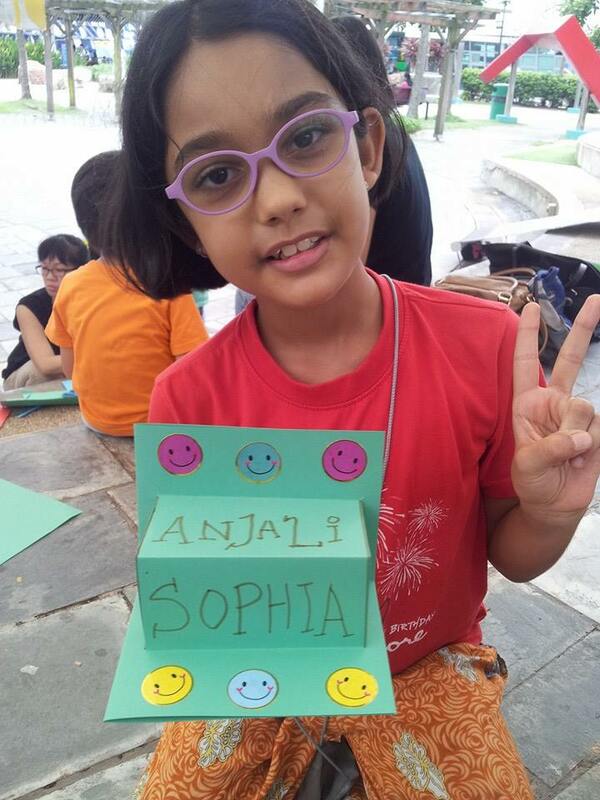 Kids started crafting their ideas more and challenged themselves to do better too. Many parents started making with their kids and in the process helped their kids to create too. Some kids went to another level by combining LED with pop ups, by making the LEDs light up as the candles in birthday pop up card! When I first look through the ChorusText website and YouTube video, I found the concept pretty interesting. ChorusText is a device endeavoured to facilitate text editing for the visually challenged, by making it sight independent. For a better understanding of what ChorusText is about, check out this video first before reading on David Effendi’s replies to our email interview. MFS: What makes you create the ChorusText? David: “Computer text editing, as we know it today, is a sight-led activity. For those without sight or with only very little remaining, it can be a challenge. Yet, text-editing is a very important part of our daily life, so it is a problem. I simply want this problem nailed. I really hope that in 20 years’ time, this becomes a non-issue, there’s a completely sight independent (and Libre!) alternative to edit text effectively. It is crucial for it to be open-source, and prioritize “Education” over everything else, including over “Economy”. I believe by making it open-source and as easy as possible for people to tinker with, we can push the limits much further, collectively. Ideally ChorusText becomes “that next project” after one has gone through an “Arduino Starter Kit”. MFS: When did you first build it and how long did you spend doing it? How did you start? David: “The initial spark of idea was in Feb 2014, and it was very different from the current state. At first I wanted to use a headtracker IMU, but there are several shortcomings with it (straying, can’t stay fixed at a point for a prolonged period, prone to unintentional inputs etc). MFS: Were you working individually or as a team? What kind of challenges did you face? David: “There’s a friend (Dr Corey Brady from Northwestern University) who helped with laser cutting the acrylic enclosure. Having a full protective enclosure really brings it up a notch. Before that, all the sliders and components were mounted on 3 small acrylic plates joined together to form a surface, cables were hanging underneath them and it was pretty fragile. Even moving it from one table to another could result in connections coming loose and the device dysfunctional (and I’d be scratching my head for the next 15 mins trying to figure out which cable came loose:) ). But with a full protective enclosure, I could bring it to Jakarta and back, without any problems at all. This gives me something solid that I can bring with me to a table, put it down and let people try when I ask their thoughts/opinions/ideas. MFS: Is the current version the final version or is it still in prototyping stage? MFS: Is this open source or will this be a commercial item for sale? MFS: You mentioned in your website that the ultimate goal is for ChorusText to become an online, collaborative text editing platform, that is enriched with social and chat functionalities. Can you explain what you mean by this? David: “I’d like to implement some kind of chat functionality into ChorusText, where the user can simply turn a knob to “Chat” mode, and he can send and receive text messages to his friends, using the keyboard and the sliders. Hopefully this helps mitigate the problem of social isolation which affects many visually impaired people (If we can’t see, we don’t travel to see our friends as much. If we can’t travel, at least we can send messages over the internet) Now I am looking into Telegram messenger’s API to see if integration is feasible. Also, it is possible to “send” physical movements over the internet ( a servo connected to a plastic hand that would rise up to give the user a “virtual hi-5” for example ), but the trick is to do so in a friendly and safe manner. Maybe, we can turn the knob to “Collaborate” mode and edit a document / text together ( like etherpad-lite or google docs, but updates happen one sentence at a time, instead of one keystroke at a time ). From some discussion, there is also an idea of developing ChorusText into a device to access Wikipedia’s content, using MediaWiki API. I think this is very interesting and worthwhile too, so turn the knob to “Wikipedia” type in some search words and the search results will be available via the sliders. Also, from discussions with people I met in GNOME Asia Summit, there were some ideas about desktop integration. Right now, there is already has a screen reader on the Linux GNOME desktop that will speak out the text on the screen / under the mouse pointer. Let’s add on to that by sending the text to ChorusText in addition to the screen reader, so the text is also available via the sliders. It would be even better if we can tap into keyboard to input events, so following each keyboard keypress, a character can be sent to Chorustext such that the contents of the currently focused textbox is the same as what’s on the device. I think this is by far the most interesting idea, but need more time to explore, especially as this falls outside my domain knowledge. All these are very interesting and definitely worthwhile exploring. MFS: Also, can you share whether you are based in Singapore or are you based in Indonesia? Are you able to share on the making culture at where you are, if not in SG? MFS: Have you attended the Maker Faire in SG before? How did you learn about it? MFS: What do you hope to go away with from the event? ChorusText is an open assistive device for people with low-vision / blindness, that lets them explore and edit text by means of touch and hearing. As you can tell from David’s sharing, his objective is to enable visually challenged people to be able to communicate through ChorusText and use the device for collaborations. If you are interested in David’s cause, check out his booth at Maker Faire Singapore which will take place on 11 & 12 July next month! Make a moodlamp and assemble fish bones to form a crane also known as a tsuru. Have a whirl at Lo fi electronics and a hands on making time at this workshop. String art is the use of string, thread, wire or fibre as an art medium to create geometrical patterns or abstract designs. The medium is wound around a series of nails fixed to a surface or the edges of a pattern, or stitched through a pattern with a needle. The lines formed are straight lines , but it is the slightly different angle or position each line takes and intersects with other lines that form the mesmerizing patterns. 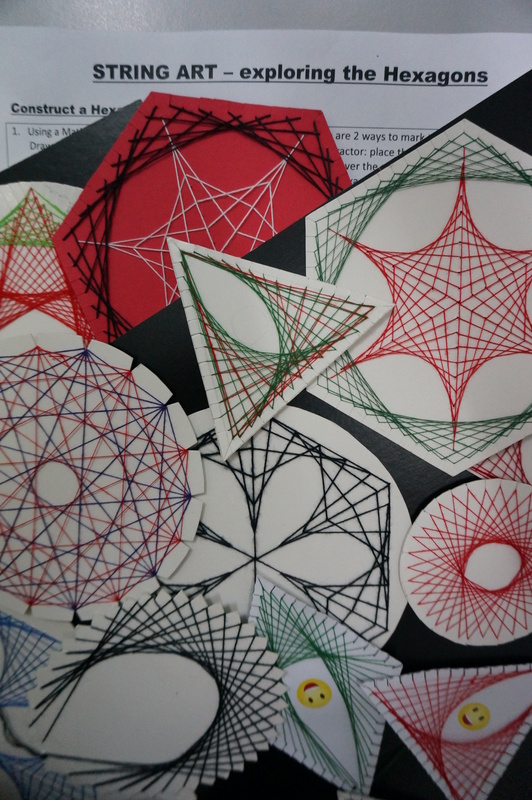 Here, participants will learn about the different kinds of string art construct their own patterns using the Maths construction set and make a geometric pattern to take home. 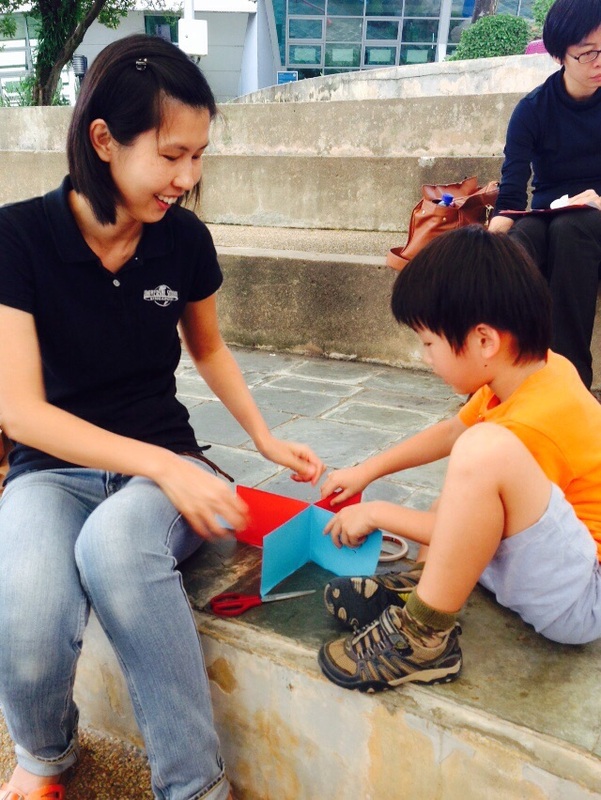 There is many things happening at Maker Faire Singapore to wow families and kids. Join the Faire to see some of the awesome projects that this year’s Makers have put together. See how some of the families in Singapore have inculcated the Maker Mindset as part of their everyday lives. This year, we are launching the Busy Hands, Happy Hearts book as part of the Faire. The book interviews fifteen families including the family of Scientist turned Artist Isabelle Desjeux and self published writer Don Bosco, creating snippets of how families work together to benefit from and contribute to the Maker movement. 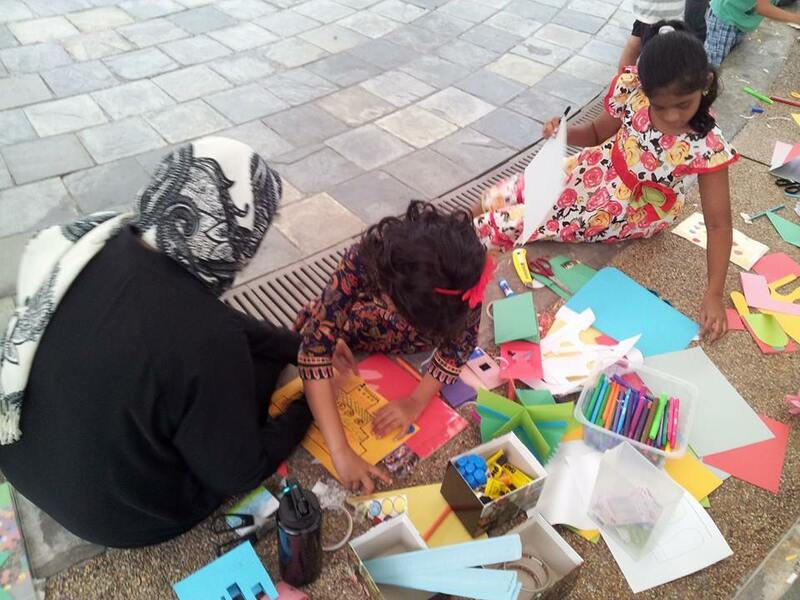 A number of these families are taking up booths at Maker Faire Singapore – so drop in and have a chat with Annabel of Luv and Co, Chinmay and Sayanee at the HackerspaceSG booth, Wai Him and his family at the Know What’s OK (Kowk family) space. Get inspired by some of the projects that they have worked on together, which you can do at home just as easily. It is also prideworthy to note that a number of schools have come on board Maker Faire Singapore. Find out how the local Educational Institutions have embraced the Maker movement and the learning opportunities it offers. 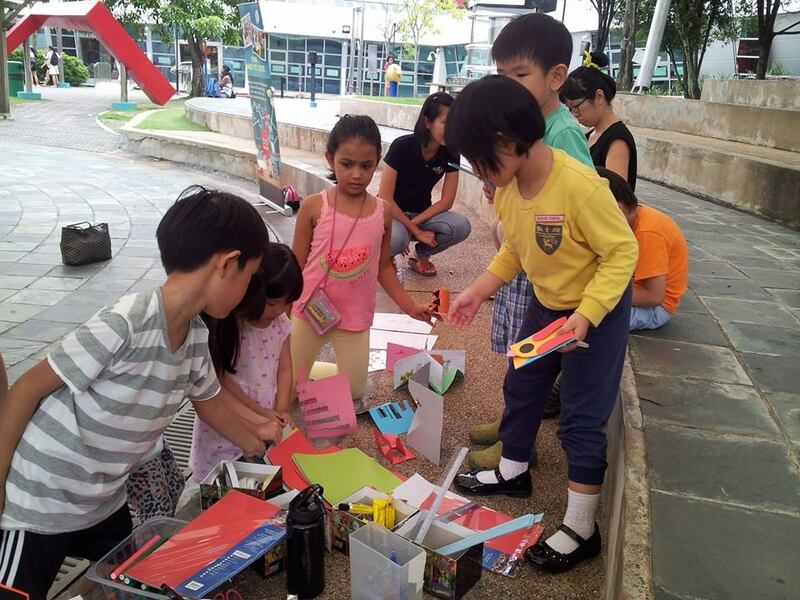 Try one of the many activity stations – ride the upcycled bikes in the carpark, get started with tinkering and find out about the Maker mindset at the Science Centre, Art Science Museum and One Maker Group spaces. Learn about sustainable living with the folks at Ground up Initiative. Wander and explore. There are nuggets of interesting things to be found in every corner. 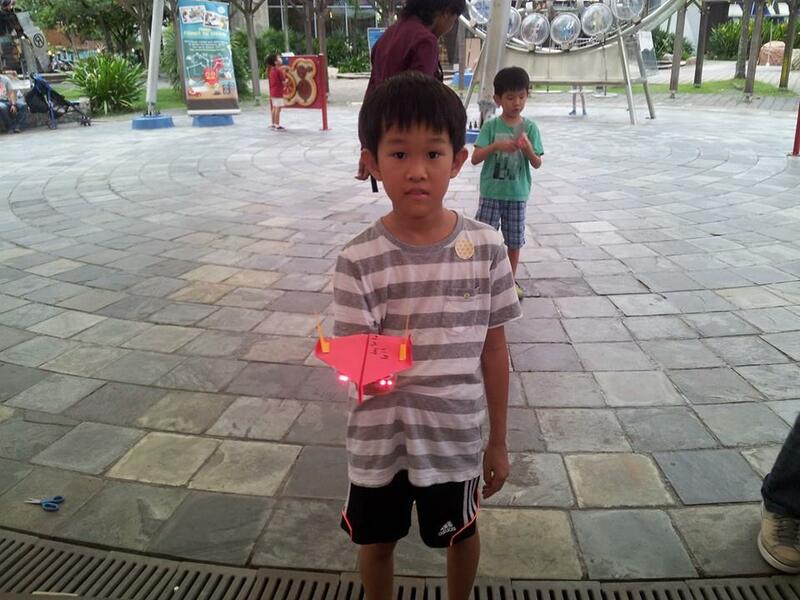 Students and Educators will have plenty of learning opportunities at Maker Faire Singapore. Here are a few of the must sees and must dos. Join the Making in Education Forum on 11th July, 3.00pm,-5.00pm where eminent educators and speakers will be sharing about the importance of the Maker Mindset in Education. Speakers include Dale Dougherty, Founder of Maker Media, Sonak Anshul from Intel mobile Telecommunications, Erik Thortennson, Founder of Strawbees, Isabelle Desjeux, Creative Director of Playeum, the play museum and Saminathan Gopal, Principal of STEM Inc. This is the first time the Making in Education Forum is being organized in Singapore, so be sure to catch it. Understand how schools have incorporated the Maker culture in their curriculum. School participation in Maker Faire Singapore is the highest this year. Speak with the Educators and Students from Chongzheng Primary, Commomwealth Secondary, Temasek Secondary, Marsling Secondary, NUS High school, ACS Independent and Nanyang Girls High school. The need for a Maker mindset continues to tertiary and beyond. Find out how the Maker movement is encouraged at the tertiary level by talking to students and teachers from Singapore Polytechnic, National University of Singapore, Nanyang Technological University, ITE college East and SUTD. Beyond School. The Maker culture is growing very fast in Singapore and the region. Just walk around the 200 over booths at Maker Faire Singapore 2015 and you will be sure to see several inspiring ideas on how the culture and mindset is closely related to Future Skills and offers new horizons for students to explore and learn! 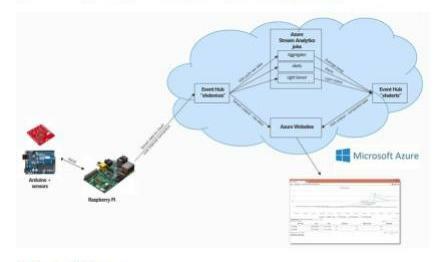 We will demonstrate how we build some IoT applications (theme: Smart Living) using hardware and software tools (e.g. temperature sensor à Arduino à Raspberry Pi gateway à Cloud à Web application accessible via web browser). The audience may choose to follow if they wish to, or they could watch how we do it. We will have some facilitators around with the tools for hands-on practice. We will also have the resources at our booth for them to try out after the workshop. A doctor by day but an artist at all times, Mabel Yap is a Certified Zentangle Trainer who will be offering beautiful ZIA (Zentangle-inspired Art) crafts. Cost: $15. Register and pay on Site.